A builder who watched a gang attack his friend in Durrington and leave him bleeding in the street said he was too scared to tell the police the whole story at first, a court has heard. Ben Brooks told Hove Crown Court that he feared for his family’s safety but later decided to tell the whole truth about the alleged attack on Wayne Heys on February 20 this year. Tommy Howlett, 24, of no fixed address, and Bradley Jake Allen, 27, a carpenter, of Orkney Court, Worthing, are charged with attempted murder, blackmail, two counts of criminal damage and conspiracy to commit grievous bodily harm with intent. Causing grievous bodily harm with intent is listed as an alternative charge to attempted murder for the jury to consider. Howlett is also charged with possession of a bladed article. Callum Alex-Hunt, 24, of Butts Road, Southwick, Joshua Bosley, 24, of Bulkington Avenue, West Tarring, Billy Howlett, 26, of Kingsland Close, Shoreham, and Katherine Olive, 20, of Harrow Road, West Worthing, are charged with conspiracy to commit grievous bodily harm with intent. All defendants deny the charges. They knew where I lived and I feared that if I was to make a statement that night they would have gone back to my family home and I did not know what would have happened. Appearing by videolink, Ben Brooks answered questions from prosecutor Alan Gardner in court this afternoon. Mr Brooks explained how he and Mr Heys had arranged to meet Tommy Howlett and Bradley Allen to sort out a dispute. He told the court that he and Mr Heys made their way to Carisbrooke Drive in Durrington and got out of their car. He said: “That is when you see a group of five to ten people. “Some were coming from Orkney Court and some were coming from Shetland Court. Asked if he recognised any of them, he said that most were wearing balaclavas or masks. However he said he recognised Tommy Howlett and Bradley Allen. “They all merged as one as they came out of both the courts. “Then Mr Heys was struck with a baseball bat to the face. Mr Brooks said he jumped in his car because he could see how serious it was, sounding the horn at the group and causing them to flee. He got Mr Heys into the car and drove off. 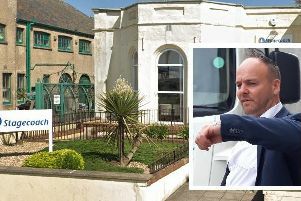 With Mr Heys in surgery Mr Brooks was spoken to by a police officer, and then went to Worthing Police Station to give a statement. He admitted to court that in both conversations he did not tell the full truth, including saying that he did not know who had attacked Mr Heys. The court heard how in interview he told police that he had not been at the attack, and instead found Wayne lying on the ground. Mr Brooks admitted that this had not been true. He told the court: “The original statement was because I was in fear and scared of repercussions. He returned to the police station the day after the alleged attack and gave a new statement, which included accusing Tommy Howlett and Bradley Allen of the attack. Mr Brooks is set to continue giving evidence tomorrow, when he will likely be questioned by defence barristers.